Hastings is an attractive seaside resort popular for its sporting and cultural events, as well as for its association with the famous Battle of Hastings of 1066 (an event that in fact took place at Battle, six miles away). Although its importance as one of the Cinque Ports ended due to a series of destructive floods and repeated attacks by the French at the end of the 14th century, the town experienced another heyday in the 19th century when it became a seaside resort, taking Brighton as its model. It's also a great place to enjoy some walking, whether exploring the beautiful historic town center - a pastime made famous by the excellent Foyle's War TV show - or the picturesque coastal surroundings. A highly recommended route involves taking the Cliff Railways, the UK's steepest funicular railway, up to Hastings Country Park, with incredible views over the English Channel as well as access to some 850-plus acres of nature reserve to explore. A row of "net lofts" - traditional tall sheds used by fishermen to store their nets - has been preserved in the old town of Hastings. Standing testament to the town's long history as a fishing port, these remarkable wooden structures on the "Stade," the old town's shingle beach, are notable for the black tar painted on them as weatherproofing, a process known as weatherboarding that is common throughout East Sussex. Be sure to also visit the Fisherman's Chapel in Rock-a-Nore Road. Built in the 19th century, it now houses the Hastings Fishermen's Museum, with displays relating to boats and the development of the local fishing industry. Also of interest is the neighboring Jerwood Gallery, the town's new museum of contemporary British art. The remains of Hastings Castle, the first fortification to be built after William the Conqueror's invasion in 1066, can be easily explored on the town's West Hill. In its almost 1,000-year history, this formidable fortress has withstood violent weather, coastal erosion (large portions of the castle have fallen into the sea over the centuries), as well as sieges and even bombing during WWII. These days, the castle is popular for its still intact "whispering dungeon" and its many displays recounting the incredible events around this historic period. Below Hastings Castle, the elegant curving buildings along Pelham Crescent were constructed between 1824 and 1828. Other architectural highlights include the many half-timbered houses standing in Hastings' narrow High Street and in All Saints Street, with its church of the same name. Next to Hastings Pier - a stunning edifice constructed in 1872 and rebuilt in 2016 after a devastating fire - stands the Conqueror's Stone, at which William the Conqueror is said to have taken his first meal after setting foot on English soil. The delightful little market town of Battle, just six miles north of Hastings, is well worth exploring for its role in the Battle of Hastings of 1066. To commemorate his victory and in atonement for the bloodshed, William the Conqueror built an abbey on the spot where his rival King Harold fell. 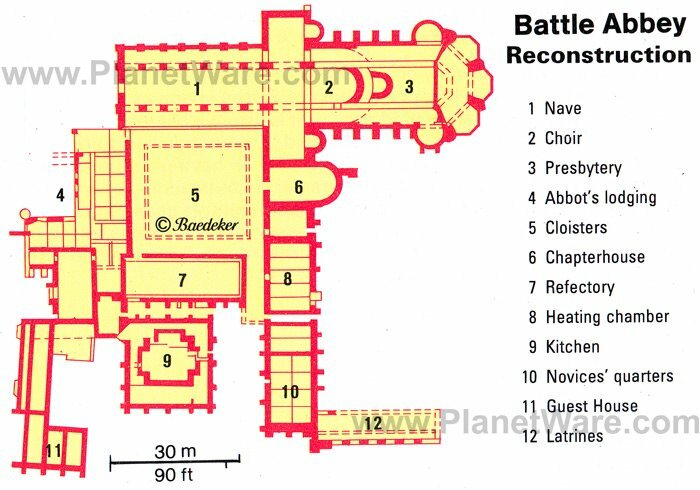 The 223-foot Benedictine abbey church, consecrated in 1094, was demolished during Henry VIII's rule. The home built on the ruins eventually became a girls' school (the tomb of Sir Anthony Browne, the man responsible for tearing it down, can be seen in nearby St. Mary's church). The gatehouse, completed in 1339, and the ruins of the monks' dormitory (1120) remain particularly impressive today, and the excellent visitor center contains many fascinating displays of the battle and its impact. Other tourist attractions in the area include Yesterday's World Battle on the High Street, a fun museum offering a nostalgic glimpse at more than 125 years of British social history brought to life through unique displays including a Victorian kitchen, as well as a grocer's, a chemist, an ironmonger's, and a sweet shop. Hastings Country Park Nature Reserve includes a variety of interesting scenery to explore, from soft sandstone cliffs and cliff top heathland and grassland to ancient woodlands and sustainably managed farmland. At 852 acres, it's one of the largest such nature reserves in England and boasts many excellent walks overlooking some of the most spectacular scenery on the south coast. Allow plenty of time to do some wildlife spotting, including watching for the many migrating birds that cross the English Channel, as well as the fulmars nesting on the cliffs, along with one of the largest populations of breeding black redstarts in the UK. Other notable birdlife includes kestrels, peregrine falcons, and buzzards, and the reserve is becoming increasingly attractive to barn owls and ravens (also of interest is a small herd of free-roaming Exmoor ponies). Hot Tip: A good place to start your adventure is at the visitor center, which houses a wealth of information about the wildlife and geology of the area. Rudyard Kipling - one of England's most famous authors, winner of the Nobel Prize for Literature and author of The Jungle Book and The Man Who Would Be King - lived in beautiful 17th-century Bateman's from 1902 until his death in 1936. Just 11 miles northwest of Hastings in Burwash, this elegant Jacobean house is home to a number of excellent displays, including Kipling's 1928 Rolls Royce, as well as furnishings. Also of interest are the beautiful gardens, kept just as they were during his lifetime, and numerous easy walking trails across the property and surrounding countryside. A pleasant tearoom is also on-site. Believed to have been built in the late 14th century, Bodiam Castle - on the northern slopes of the Rother Valley, eight miles northeast of Battle - is widely regarded as one of the most romantic castle ruins in England. Never enduring a siege, it has been able to retain much of its original character. Surrounded by the River Rother and an unusually wide moat, this square castle, with its sturdy round battlements, stands as if on an island and is a delight to explore. For a special treat, walk to nearby Bodiam Station, last stop on the 10-mile-long Kent & East Sussex Railway, a fantastic heritage train ride all the way to beautiful Tenterden in Kent (for a truly memorable sightseeing adventure, buy a return ticket). Just 12 miles northeast of Hastings, the quaint town of Rye, with its bustling harbor, is one of the best-preserved medieval towns in England. This must-see attraction is home to enchanting cobbled streets such as Mermaid Street, and the town is chock-full of excellent boutique shops; cafés; tearooms; restaurants; and inns, including the famous Mermaid Inn, once the haunt of the notorious Hawkhurst Gang. While there, visit Camber Castle, built by Henry VIII and located in lovely Rye Harbour Nature Reserve (interior guided tours of the castle are available the first Saturday of each month, July-September, 2pm). Rye is a popular hangout for writers, and Lamb House, once the home of Henry James, was featured in the hit BBC mini-series Mapp and Lucia. Another nearby attraction worthy of a visit is Great Dixter House and Gardens in Northiam. This 15th-century manor house features fascinating furniture and needlework displays and is set in a garden designed by Lutyens that includes a sunken garden, a walled garden, and a lily pond, as well as a fascinating topiary. Smugglers and pirates once frequented the Hastings area, and Smugglers Adventure is a fascinating insight into their lives and times. In the pre-glacial St. Clements Caves, the adventure includes an opportunity to explore the labyrinth of caves as you uncover the secrets and dangers facing smugglers through more than 70 life-size characters and hands-on displays. Other popular things to do for families in and around Hastings include visiting Drusillas Park in Alfriston, considered one of the best small zoos in the country (and popular for its Thomas & Friends train and Hello Kitty themed rides), and the Blue Reef Aquarium, with its displays of aquatic creatures. Splendid Herstmonceux Castle, 10 miles west of Battle, is a moated red-brick Renaissance manor house from the 15th century that once served as home to the Royal Observatory. Today, its 600 acres of beautiful woodland and superb Elizabethan gardens are open to the public throughout the spring and summer. The grounds include excellent trails, a lovely folly next to a lake, and magnificent 300-year-old chestnut trees, as well as seven themed formal gardens. Beautiful Bexhill-on-Sea is well known as a classic Victorian-era town, as well as for being the first place in Britain to have a motor-racing track. These and other historic facts are celebrated at the Bexhill Museum, opened in 1913 and home to the excellent Sargent Gallery, with its quirky mix of objects from the stone-age to the Egyptians, as well as displays about the town's links with dinosaurs (there's even an original painting by L.S. Lowry). Also worth a visit is the Technology and Motor Racing Heritage Gallery celebrating Bexhill's role as the birthplace of British Motor racing, including a reproduction steam-driven car and the 1993 world-record-breaking Volta electric car. It's also home to the lovely De La Warr Pavilion, built in 1935 in the International Modernist style, the first welded steel frame building in the country. William the Conqueror is supposed to have landed in the small resort town of Pevensey Bay in 1066 before heading off to conquer England. A mile inland is the pretty village of Pevensey, where the Normans built a castle using the remains of an old Roman fort. The 20-foot-tall castle walls are still standing, as are the remains of the dungeons, gate tower, and mint house.